I get it when kids don’t get along, like kids in school, in playground fights and such. But when those kids grow up and create massive companies and massive wealth, it’s hmmm… interesting… to see how they get along in their grown up playground. This blog is about the heads of big companies, who they are, how they got there, and how they’re doing their best to get along in a highly competitive, high-stakes world, where they are so highly visible, they become part-celebrity, part-company creator. Who does it best? Along with Noah Glass, Evan Williams, and Biz Stone, Jack Dorsey launched Twitter in March 2006. Born Nov. 19, 1976; 35 years old. Attended New York University. Did not finish. Mentored Kevin Systrom, one of Instagram’s founders. Is an angel investor in The Fancy, a Pinterest competitor. Was an angel investor in Instagram. Born May 14, 1984; 28 years old. Facebook has approximately 845 million registered users. Attended Harvard. Did not finish. Just bought Instagram for approximately $1B. The deal is frozen until the FTC investigates, which could take 6 months or more. Along with Mike Krieger, launched Instagram in October 2010. Information on Mike Krieger was not readily available so details about Kevin Systrom, the more public of the two founders is reported here. Born December 30, 1983; 28 years old. Instagram has 75 million – 100 million or more registered users. Attended Stanford. Graduated with a degree in Management Science and Engineering. Worked for Google upon graduation. 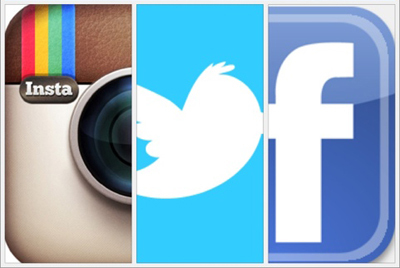 At different points in time, Google, Facebook, and Twitter had each approached Instagram with interest in buying it. There is no Find Your Twitter Friends on Instagram. Twitter cut off Instagrams’s access to that API. Facebook shutdown Twitter’s Find Your Twitter Friends on Facebook feature. Facebook waits for the FTC to rule on its Instagram acquisition. Jack Dorsey no longer Instagrams his photos on Twitter. Jack Dorsey has moved #onward and his other company, Square, has just signed Starbucks to their credit and debit card processing program, and Starbucks has invested $25M in Square. Instagram continues to grow rapidly in users, but has no revenue. These guys really do play well together, despite their differences in look, feel, background, and dress. They have personalities that match their companies, kind of like when a dog looks like their owner. I think even I’m surprised at the lack of punching, fighting, kicking, and swearing that could go on between these guys. It’s more like a gentlemanly chess match, where each move is calculated and feelings aren’t part of the game. Just steely focus and eyes on the prize. For me, that prize is buying in on a Twitter IPO and ringside seats to the Facebook/Instagram integration. That should be interesting.